Everything you need to know about the Temple Owls as the NCAA tournament begins. As part of its preview of the 2016 NCAA men's basketball tournament, SI.com is taking a look at all 68 teams in the field. RPI and SOS data from realtimerpi.com. Adjusted offense and defense statistics are from kenpom.com and measure the number of points scored and allowed per 100 possessions, and the team's national rank. All other advanced stats are also from kenpom.com (unless noted otherwise) and are through March 14. 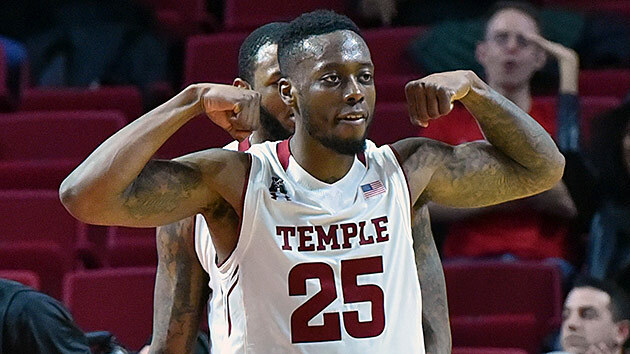 The Case For: Temple handed previously undefeated SMU its first loss on Jan. 24 and won the American Athletic Conference regular-season title outright with sweeps of Cincinnati and UConn. The Owls have a balanced scoring attack with five players averaging between eight and 16 points per game. Three players—DeCosey, Obi Enechionyia and Devin Coleman—average at least 1.5 threes per game and at least 36% shooting from behind the arc. If you value veteran teams that have experience playing together and take care of the ball, it may be worth buying stock in Temple. The Owls rank among the top 80 teams in the country in experience, minutes continuity and average height, in addition to having the second-best turnover percentage on offense (13.7%). Temple drew No. 7 seed Iowa, which had a dreadful finish to the season after losing six of its last eight games, but the Hawkeyes are an even more experienced, taller group than the Owls with offensive and defensive efficiencies ranking in the top 35. If Temple wins its first round game, it will most likely get a rematch with Villanova a little over a month after the Wildcats defeated the Owls by 16. SI prediction: Lose to No. 7 Iowa in the first round.